Leading Exporter of elevator traction machine, traction machine, upper traction machine, elevator gear box and geared traction elevator from Ahmedabad. 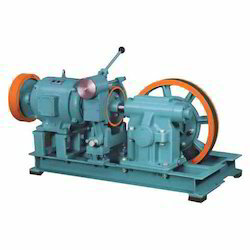 operating at higher speeds, elevator traction machine offered deliver support as gearless and gear based traction machine. the gearless support offered feature use of woven steel cables attached to elevator top. here, the combined weight of elevator car & counterweight delivers necessary traction support as sheave turns. the other option offered of geared traction involves use of electrically controlled brake that is present between motor and reduction unit which assists in stopping the elevator. 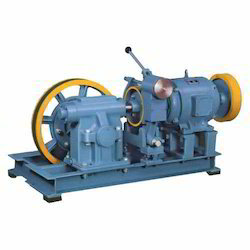 We are the Leading manufacturer of Traction Machine. The traction-hydraulic elevator has overhead traction cables and counterweight, and is driven by hydraulic power. The weight of the car and its passengers, plus roping ratio, reduces the demand from the pump to raise the counterweight, & helps in reducing the size of the required machinery. With the entire lift system located within lift shaft, Upper Traction Machine offered provide for smooth and silent operations. Latest software technology support thus requiring minimum hardware support and others. We offer Elevator Gear Box manufactured from the finest quality materials. These Gear Box is used for controlling the speed of the lifts. 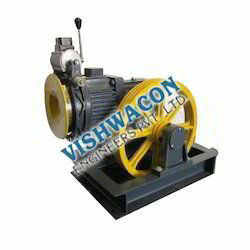 Our company is among the most sought after offering Geared Traction Elevator to the clients. Geared Traction Elevator is manufactured under the administration of our professionals by utilizing the superior quality material.